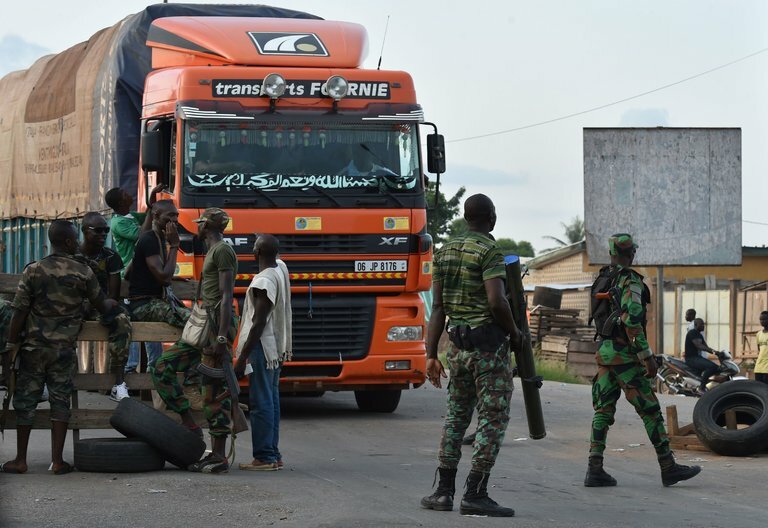 A group of mutinous soldiers has blocked access to parts of the Ivory Coast city of Bouaké, as fresh tensions have arisen over the government’s plan to pay its troops. ABIDJAN, Ivory Coast — The Ivory Coast government sent a convoy of elite forces to the city of Bouaké on Sunday in an effort to quell a three-day military mutiny over pay that has already left one former rebel dead and five civilians wounded. The rogue soldiers showed no signs of backing down, setting the stage for a tense standoff in Ivory Coast, a West African country still scarred by a civil conflict that ended in 2011. “We hope for a resolution as soon as possible,” a government spokesman, Bruno Koné, said by phone, declining to say whether the government had opened talks with the mutineers. The unrest is the latest twist in a monthslong drama that has revived painful memories of the civil conflict. The mutiny began in January and quickly spread across the country as soldiers, many of them former rebels who helped bring the president, Alassane Ouattara, to power, fired shots in the air to demand back pay and better living conditions. The government temporarily tamed the uprising by agreeing to pay the roughly 8,400 soldiers a reported $19,900 each. An initial round of payments was distributed, with the rest to be paid in installments. Then on Thursday, a spokesman for the rogue soldiers announced that the demand for more payments had been dropped. Mutineers shot at least five civilians on Sunday in Bouaké, the nation’s second-largest city and the center of a civil conflict that tore the country in half and left thousands dead from 2002 to 2011, after people there took to the streets to protest the mutiny, according to residents and multiple news reports. A former rebel shot by the mutineers died of his wounds on Sunday. As of Sunday evening, access to parts of Bouaké was still blocked and residents were nervously anticipating the arrival of the security forces, said Moussa Coulibaly, 30, a student from Bouaké.